Margaret Golden, age 102, of Spring Valley, died Sunday, November 11, 2018 at her home at Valley Villas. Visitation will be on Monday, December 3, 2018 from 4 to 7 p.m. at Sacred Heart Catholic Church, Spring Valley with a time of sharing at 7 p.m.
Memorial service will be Tuesday, December 4, 2018 at 11 a.m. at Sacred Heart. Burial in St Joseph’s Catholic Cemetery, El Paso, at a letter date. 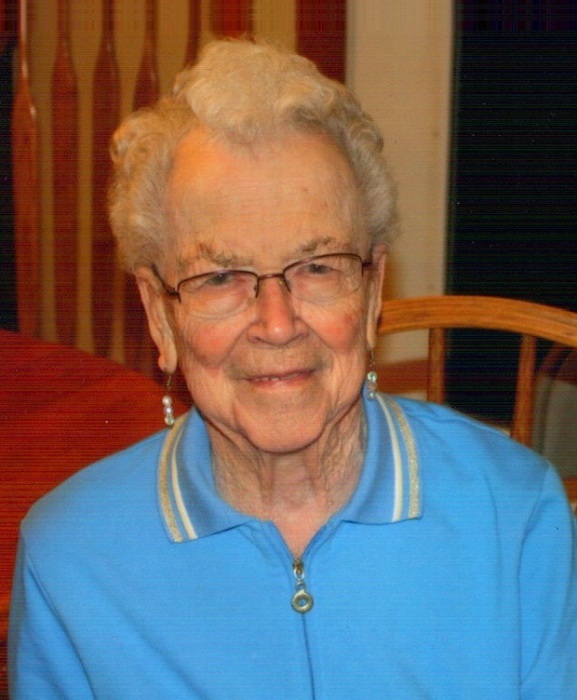 Margaret Golden of El Paso Township passed away on November 11, 2018 at the age of 102. Margaret and husband Allen operated a purebred holstein dairy farm near El Paso. She was born January 3, 1916 to Matthew and Julia Shafer. After graduating from the Spring Valley High School she went on to school and became a beautician. By the age of 19, she had already established her own beauty salon in Spring Valley. She married Allen Golden in 1939 and bore three sons. Tom ( Mary Kaye), Barry(Connie) and Bill (Susan). Margaret is also survived by 12 grandchildren, 19 great grandchildren and 7 great, great grandchildren. Margaret was known far and wide as the “pie lady.” She loved making apple pies and at her peak was making over 150 pies every fall with about half being given away to family, neighbors and friends. She was also known for her doughnuts and long johns which brought frequent surprise visits from neighbors and friends. She was the ultimate example of a caring and supportive woman who was loved by the community.